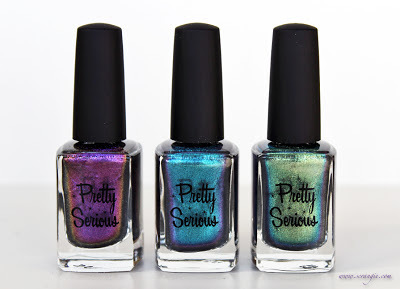 This new(-ish) collection from Aussie brand Pretty Serious Cosmetics really doesn't need an introduction. 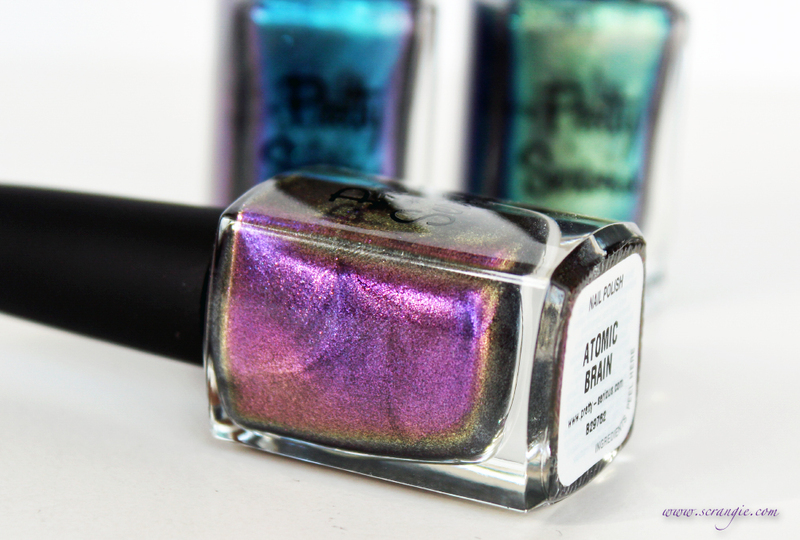 The polishes pretty much speak for themselves. Foily. Sparkly. Color-shifting. Just... look at them. You're gonna like 'em. Pretty Serious Atomic Brain. When viewed straight-on, I see a mix of warmer, redder purple and cooler, bluer purple, with little blue and red sparkles throughout. But, tilted at an angle, the polish gets and awesome yellow, orange and green flash. Pretty Serious Galaxy Invader. 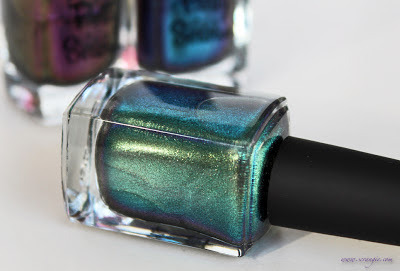 A turquoise and deep blue near-foil sparkle that flashes royal purple with a tiny hint of gold and red at one angle, and hints at green and teal at the opposite angle. Pretty Serious Phantom Planet. A light green with darker, more mossy-looking green accents from the front. But change the angle and it flashes bright green, blue, turquoise and gold, and at the opposite angle you get a little yellow and teal and just a tiny hint of purple all the way at the edges. The formula on these was good. Thicker than the current standard 3-free polish texture, but not gooey or stringy or anything like that. It goes on smooth without running or pooling and doesn't seem to clump up from the thickness. It has an almost foamy or oily texture if that makes sense. I used three coats here and I thought they all looked best that way. Dry time is a little longer than average, likely due to the thickness, but applying thin coats and giving each a couple minutes to set reduces the length of drying. A small collection but a very good one. You know I'm a sucker for duochromes/multichromes, and these ones are quite pretty. The finish on them is interesting. It's not really a glitter, not really a glass fleck, too chunky to be a straight shimmer but not really as dense or reflective as most foils. It's right in between a foil and a glass fleck, I'd say. Shiny and speckled-looking, but not rough or chunky like glitter. Lots of different colors mixed in when you look up close. Plus, cool sci-fi B-movie theme. No complaints here. The Pretty Serious They Came From Beyond Space! 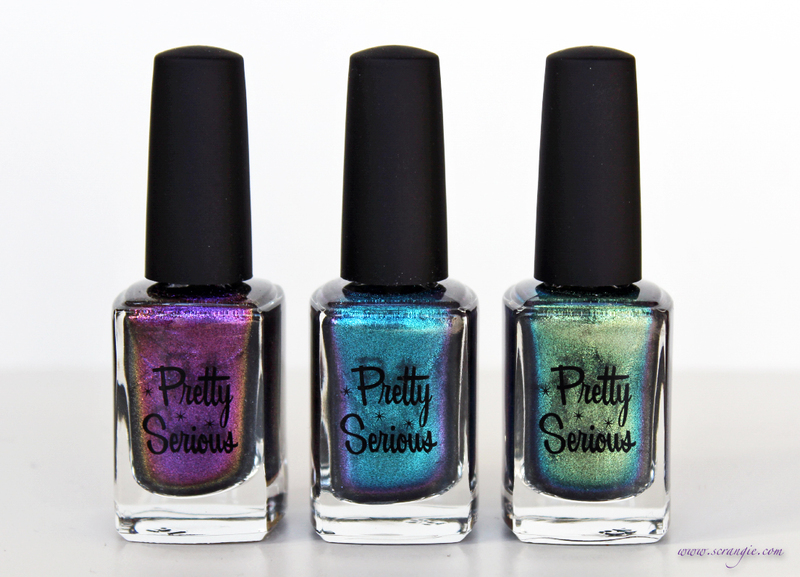 Collection is available directly from Pretty Serious Cosmetics. It's not limited edition, they ship internationally, and you can get a 10% discount on the collection if you buy all three colors at once. It's great to see you back! 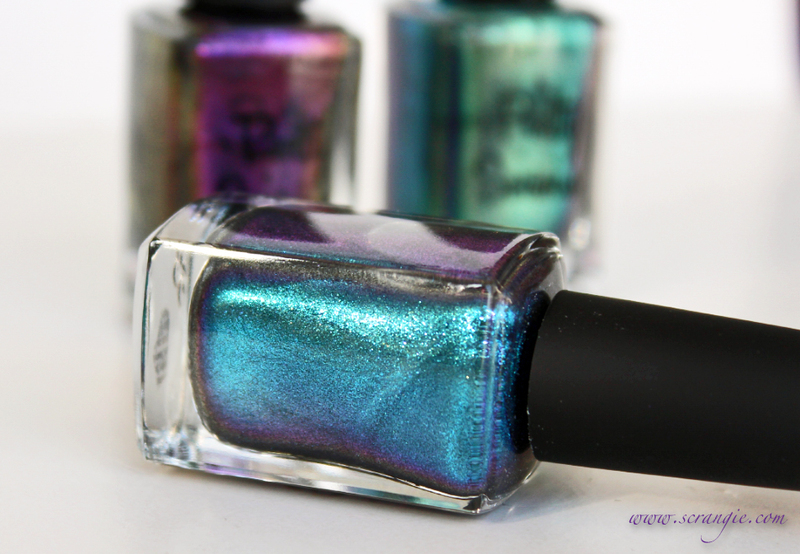 Yet again, you've caused me to add more polish to my wishlist. Darn you! These are (appropriately) pretty polishes, but mostly... YOU'RE BACK! ZOMG I MISSED YOU NEVER GO AWAY AGAIN! Sorry. I swear I'm not a stalker, it's just the swatch withdrawal talking. Missed you Scrangie! Thanks for the review, these look awesome! I'm so glad you'e BACK! Except that now I just feel really, really jealous. These are awesome. These are so pretty! Glad to see you back! I want to cry just reading this, I'm so glad you're back Scrangie! Great post. it's nice to be concerned -- but did it never occur to you that this might be a hurtful thing to say to someone? I like the first one the most! Great swatches. Aren't they great?? Galaxy Invader and Atomic Brain were the first polishes I bought in 3 years! Didn't we have a discussion about how there were to be no more lemmings, polish or musical from you!?! *sigh* guess I need these too :D And glad to see you're posting again! OMG....you're back!!! You've made my day! Great to see a new post from you. First thing I do every morning is checking your blog and this morning it felt like a present. Welcome back Scrangie. omg they are all so gorgeous! HOORAY! NEW SCRANGIENESS. SCRANGOUSITY. WHATEVER. Yay! Also these are excellent. How do these compare to last year's Bohemian duochromes from China Glaze? These look more foil-like and less frosty/streaky, which would be great. 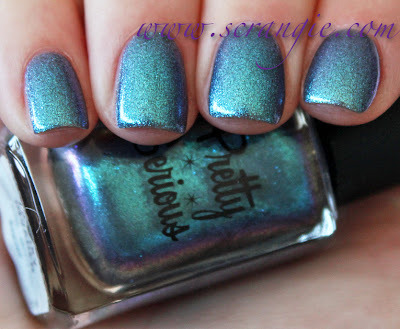 Yeah really beautiful swatches =D !!! Love the blue one ! Scrangie forever <3 ! Beautiful polishes, I hope you enjoyed your break, although I imagine you have many swatches to show us now :) please don't leave again for a while! Beautiful swatches! How does Atomic Brain compare w/ Orly Space Cadet? These are just so pretty!